Mzuzu is Malawi's third most populous city, though it is better known to travellers as both the jumping-off point for Nkhata Bay and the first major conurbation encountered if entering Malawi from Tanzania. Mzuzu is noticeably colder than the lakeside towns. There is an airstrip in Mzuzu but it does not appear to be served by any scheduled airlines. There are several AXA buses per day from Karonga to Mzuzu, taking about 4.5 hours. There are also several AXA buses per day from Mzuzu to Lilongwe, taking about 6.5 hours. There are many matatus (minibuses) from Nkhata Bay to Mzuzu each day taking about an hour. There is also an AXA bus leaving Mzuzu for Nkhata Bay at about 6:30am, and one returning from Nkhata Bay at about 1:00pm. 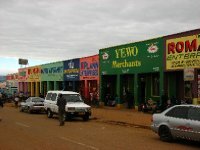 The centre of Mzuzu is certainly small enough to traverse on foot. Flame Tree Guesthouse, (+265) 1333053, Flame Tree Guesthouse (though note this website is principally for the sister guesthouse beside Lake Malawi) - Flame Tree Guesthouse sits in a residential area less than ten minutes' walk from the bus station. It's a clean, quiet place with meals available. This is version 5. Last edited at 10:01 on Aug 12, 15 by Utrecht. 4 articles link to this page.